No print issues in stock. An original color-tinted sixth-plate ruby ambrotype pictures a member of Collis’ Zouaves (114th Pennsylvania Infantry) from the Bob Lucas Collection. The editor discusses images of historical significance. He highlights the albumen photograph of African American soldiers at L’Overture Hospital in Alexandria, Va., (see page 42) and describes it as one of the most historically significant Civil War images to surface in recent times. Feedback includes praise from a former seasonal park ranger at Gettysburg, a new subscriber who makes a family connection, readers who answered a question posed in the last Photo Sleuth column, and a suggestion that amateur photographer Montgomery Meigs may have borrowed Alexander Gardner’s studio. A unique 6-point scoring system grades images in Civil War Hard Images by Christopher Anderson and Ben L. Pauley (SoldierCollectibles.com). A selection of images reproduced in the book begins on page 16. 1st Sgt. Joseph Bell Kemp found himself relatively alone during the Battle of The Wilderness after his comrades on the left and right fell. Kemp glimpsed three Confederates in front of him, and the personal encounter that followed ended with Kemp in possession of a rebel flag—end eventually the Medal of Honor. Identifying a Civil War soldier in an individual portrait can be tricky enough. But for advanced photo sleuths, sorting out multiple soldiers in a group portrait poses unique challenges. Kurt describes how he used a concurrent service timeline to help discover the identities of six staff officers who served in the 64th Illinois Infantry. Young patriots enlisted in the Union army for a variety of reasons. But for one 16-year-old boy, Cabot Jackson Russell, the moment of decision came after he learned that one of his cousins had been killed in battle. Russell would go on to enlist in the 44th Massachusetts Infantry, and later become an officer in the 54th Massachusetts Infantry. His tenure in the 54th was short-lived. On July 18, 1863, he was killed along with Col. Robert Gould Shaw and other men in the failed assault against the garrison of Fort Wagner, S.C.
A sixth-plate daguerreotype of Micah Jenkins pictures the son of South Carolina as a cadet at the Citadel about 1851. Jenkins is also pictured in another portrait, a quarter-plate ambrotype, taken about 10 years later when he served as a Confederate brigadier. A selection of Confederate images from Civil War Hard Images includes a pair of North Carolina boys in Gen. Lee’s Army of Northern Virginia, a soldier who may be connected to the Cherokee Indian nation and two soldiers enjoying a smoke. “During the Civil War, Union and Confederate troops both adopted exotic dress in the transgressive guise of the Zouave uniform,” observes Marr. He goes on to explore the cultural phenomenon that excited and energized Americans before and during the war. Seven images illustrate the text, including portraits of William S. Dalton of the Coldstream Zouaves, which became Company D of the 46th Ohio Infantry, and Cpl. Richard Bloxham of Hawkins Zouaves, also known as the 9th New York Infantry. A total of 19 representative portraits from Miller’s extensive collection features Zouaves from across the Northern states. Identified images include Cpl. Joseph Hughes of Duryée’s Zouaves (165th New York Infantry), Sgt. Augustus Wright of the Burnside Zouaves (1st Rhode Island National Guard), Pvt. Lucien Barnes of the Albany Zouave Cadets (10th New York State Militia), 2nd Lt. Winfield Scott Tefft, Capt. Fredrick Ullman Jr., 1st Lt. Louis A. Cowell, Sgt. Francis Richard “Frank” Kelley and Pvt. Horace Knapp of the Racine Zouave Cadets of Wisconsin, and Capt. John J. Babcock of the 14th New York Infantry. An unusual albumen portrait of 11 U.S. Colored Infantrymen and a chaplain begs a question: Were these men the burial detail that protested orders and refused to bury one of their own in a civilian cemetery? After exhaustive research, the author places the men at L’Overture Hospital in Alexandria, Va., after the Battle of the Crater and shares his theory. The men in the albumen portrait are all identified. Crater casualties include Adam Bentley, Adolphus Harp of the 19th, Jerry Lisle of the 28th, Leander Brown and Stephen Vance of the 30th, George H. Smith and Tobias Trout of the 31st. Other soldiers include Samuel Bond of the 19th, William DeGraff of the 22nd, Robert Deyo of the 26th, John H. Johnson of the 27th, and Chaplain Chauncey Leonard. A separate portrait of Frank Snow, a U.S. Christian Commission volunteer who owned the photograph, is also included. William H. Worthington was admired by his superiors and despised by his men in the 5th Iowa Infantry. His untimely death on the picket line prompted a shakeup in the regiment that ended with Prussian-born and military educated Charles Leopold Matthies in command. He led his men out of a tight spot at the Battle of Iuka and other engagements. Illustrated with a portrait of Matthies with two of his subordinates, Maj. William S. Robertson and Adj. Robert F. Patterson. In “Photos, a Lithograph and the Raucous 1st Cavalry,” Mike introduces readers to a unique photograph of a lithograph of the 1st Regiment Cavalry, New York State Militia. Col. Thomas C. Devin commanded the regiment. If Lt. Alexander W. Selfridge had a moment to take in what was about to happen to his company at the Battle of Cedar Mountain, it was probably fleeting. Selfridge and his men belonged to Company F of the 46th Pennsylvania Infantry, and they would have a tough go of it at Cedar Mountain, They would survive the heavy fighting and participate in numerous other engagements. Illustrated with a portrait of Selfridge and two of his subordinates, lieutenants Orlando J. Rees and Merrick Jackson. The photograph gallery of New Yorker Mathew B. Brady took the portrait that introduced Southerners to their new leader. The likeness was pasted to countless cartes de visite and featured on a badge designed by John H. Fitzgibbon of St. Louis, Mo. 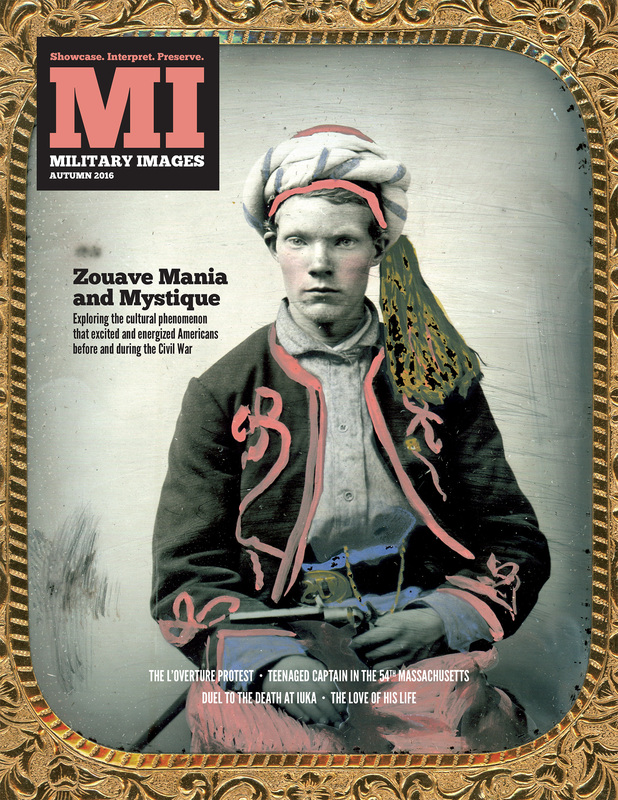 Included in this issue is a group of musicians in the 26th New York Infantry, a man dressed as “Brother Jonathan,” two portraits of a young African American who may have been a slave, servant and soldier, and a Confederate who appears to be from the Trans-Mississippi region of the war. John Faunce served as the original commander of the Harriet Lane, the modern U.S. Revenue Service cutter named for President James Buchanan’s comely niece. Faunce found himself and his ship in Charleston Harbor when Fort Sumter was bombarded. Though he was eventually separated from the beloved Lane, he eventually returned to save her from a sad fate in the faraway Cuban port of Havana. Two cartes de visite of John Huey Weeks, and officer in the 91st Pennsylvania Infantry and the Veteran Reserve Corps, picture him with head bowed over a table. In one of the portraits can be seen the faint image of a young woman—a spirit photograph.